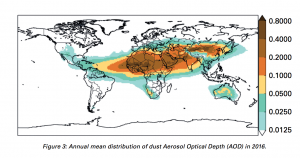 GENEVA, April 13, 2017 – The World Meteorological Organization has issued its first annual Airborne Dust Bulletin, giving an overview of atmospheric dust levels and geographical distribution in 2016. The report is part of efforts to improve observations and warnings of sand and dust storms, which pose serious risks to the environment, human health and economy in arid and semi-Arid regions. 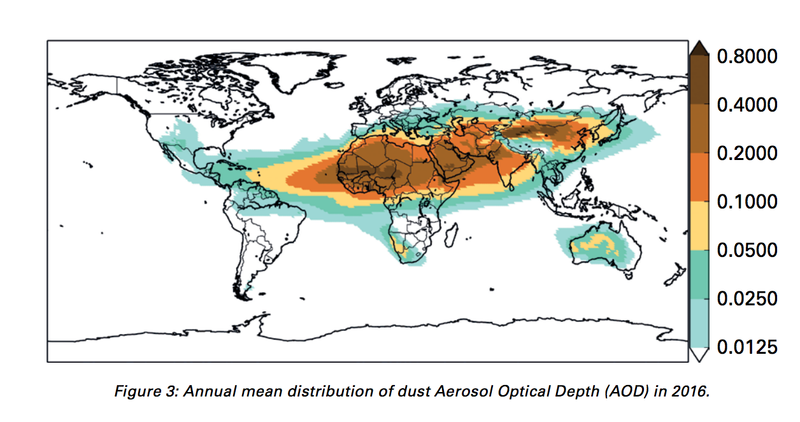 The global average Aerosol Optical Depth – a measure of the dust burden – for 2016 was similar to previous years, according to the report, which highlighted particularly severe sand and dust storms in Iran and China/Mongolia. It said there was no clearly-defined trend from 2003 through 2016, partly because of modelling capacity constraints and the relatively short time period since systematic observations began in 2003. The report was presented to a symposium of WMO’s Global Atmosphere Watch programme, which seeks to strengthen scientific understanding of the increasing influence of human activities on atmospheric composition and subsequent environmental and climate impacts. “Every year, an estimated 2,000 million tons of dust is emitted into the atmosphere. While much of this is a natural part of the Earth’s cycles, a significant amount is generated by human-induced factors, especially unsustainable land and water management,” said Enric Terradellas, chair of WMO’s Sand and Dust Storm Warning Advisory and Assessment System steering committee. “Dust is a major component of atmospheric aerosols, which affect the global climate and have important effects on weather through their influence on atmospheric dynamics, clouds and precipitation,” he said. “We need to improve our observations and monitoring of airborne dust for public safety considerations but also to understand the feedbacks with the climate system,” said Mr Terradellas, who is a scientist with the Spanish meteorological service AEMET. WMO set up the Sand and Dust Storm Warning Advisory and Assessment System in 2007 to improve observations and information on airborne dust and provide forecasts a full three-days in advance. Building on the central role of meteorological services in air quality monitoring, WMO has established a network of forecast centres to enhance regional and international cooperation. The Barcelona Dust Forecast Centre provides forecasts of sand- and dust-storms for northern Africa, the Middle East and Europe, whilst the Asian centre is operated out of Beijing by the China Meteorological Administration. A regional centre in Barbados is responsible for the Pan-American region. There are plans for a regional centre for West Asia to cover the Arabian peninsular. WMO is working with other partners including the World Health Organization, UN Environment Programme and United Nations Convention to Combat Desertification to inform policy decisions. Sand and dust storms occur when intensely hot air over the desert causes the lower atmosphere to become unstable, leading to strong winds that stir up vast amounts of loose sand and transporting it for hundreds, sometimes thousands, of miles. Airborne dust is linked to health problems like respiratory ailments and meningitis, regularly causes airport closures and flight cancellations as well as dangerous road conditions. It disrupts key socio-economic sectors like agriculture and schooling. Most of the dust in 2016 was concentrated around its main sources: the belt of tropical and subtropical deserts of the northern hemisphere, stretching from the Sahara through the Arabian and Syrian deserts to the Thar desert between India and Pakistan, as well as the mid-latitude deserts of Central Asia and China-Mongolia. The estimates of dust content were derived from daily forecasts from the Copernicus Atmosphere Monitoring Service of the European Center for Medium-range Weather Forecast. Compared to the 2003-2015 reference levels, less dust was observed over much of the Sahara and less dust was transported over the Atlantic in 2016. Conversely, dust transport to the Gulf of Guinea and to the rest of Equatorial Africa was above average. While relatively low amounts of dust were emitted from the Sahara in the summer, a remarkable amount of dust activity occurred in the southern Sahara and the Sahel during the first weeks of the year because of prevailing winds. In the northern part of the Middle East, dust levels were slightly below the 2003-2015 average, whereas in the south of the Arabian Peninsula, frequent dust episodes in the spring result in higher-than-average annual levels. Above-average levels of dust were also seen in the Pakistan-India region, where the strong spring activity led to high dust concentrations in the Indo-Gangetic basin and even in South-East Asia. China and Mongolia saw a particularly severe dust event in May. Elsewhere, the dust concentration was lower than usual in Australia and higher in southern Africa. A severe dust event occurred in July 2016 in Sistan-Baluchestan, an Iranian province located in the south-east of the country, along the border with Afghanistan and Pakistan. A progressive desiccation of the wetlands that has been attributed to climate change, a prolonged drought and overuse of water resources on both sides of the border has turned this province into one of the dustiest places on the planet, with an average 167 dusty days per year. Between 13 and 14 July 2016, weather and wind conditions caused a dust plume to spread over the entire south-eastern part of Iran. The daily-averaged level of small particulate matter PM10 reached 10,000 µg/m3 in Zabol and visibility was reduced to less than 100 m. Thousands of people received emergency aid and dust masks from the Iranian Red Crescent. “The high frequency of similar episodes makes the situation unsustainable. Iran has mainly suffered due to poor water management, the depletion of underground water, and development policies that failed to consider the impact on the environment and ecosystems. Fortunately, steps have already been taken to reverse the situation, both nationally and internationally,” said the WMO report. The arid and semi-arid regions of Northern China and Mongolia, stretching from the Taklamakan to the Gobi Desert, are major sources of dust. Over this vast area, dust events are frequent and sometimes severe, especially in spring. A severe event occurred on 10 and 11 May 2016 when a cold front with low pressure swept the region from west to east. This severe dust event was successfully predicted by the China Meteorological Administration. The high frequency of dust events in the region, with peak values in the 1970s, is not only related to climatic conditions. It is also linked to the expansion of the desert due to massive deforestation. In an effort to combat the loss of its grassland to the Gobi Desert, the Chinese Government started several ecological restoration projects, including the so-called Great Green Wall to re-forest the northern provinces of China with 100 billion trees.